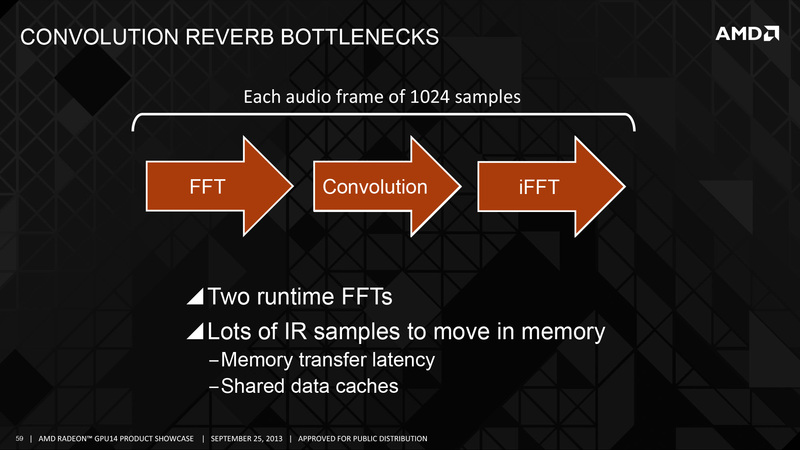 As part of today’s public session for AMD’s 2014 GPU product showcase, AMD has announced a new audio technology for some of their upcoming GPUs. Dubbed TrueAudio, Although technical details are light at this time – more is certainly to come under NDA – what AMD is describing would be consistent with them having integrated some form of audio DSP into their relevant GPUs. The inclusion of an audio DSP comes at an interesting time for the industry. The launch of the next generation consoles has afforded everyone the chance to make significant technology changes, as the consoles and the realities of multi-platform game publishing meant that many developers stuck with a least common denominator on input, graphics, and audio. For PC game audio this meant that most audio was implemented entirely in software, just as it was with the consoles. This also coincides with significant changes to the Windows audio stack that came with Windows Vista. Vista saw a significant overhaul of the Windows audio stack, where after years of bad experiences with audio hardware and dodgy drivers for low-end audio chips that implemented most of their functionality in software, Microsoft outright moved the bulk of the audio stack into the user space, i.e. into software. This vastly improved the audio stack stability and baseline features, however in doing so it cut off hardware audio acceleration of the principle 3D audio API of the time, DirectSound 3D. But with the new consoles and Windows 8, the opportunity has arisen for changes to how audio is handled, and this is what AMD is seeking to capitalize on. Audio DSPs are nothing new, with pioneers such as Creative Labs and Aureal jump-starting the market for those back in the late 90s. But due to the aforementioned issues they haven’t been a serious market since the launch of Creative Labs’ X-Fi back in 2005. Consequently what AMD is going to be doing here – offloading audio processing to their DSP to take advantage of the greater capabilities of task-dedicated hardware – isn’t itself new. But this is the first serious effort on the subject since 2005. The advantages of utilizing the DSP are fairly straightforward. Simple audio calculations are cheap, and even simple 3D effects such as panning and precomputed reverb can be done similarly cheaply, but real-time reflections, reverb, and 3D transformations are expensive. Running the calculations to provide 3D audio over headphones and 2.1 speakers, or phantom speakers and above/below audio positioning in 5.1 setups is all very expensive. And for these reasons these effects aren’t used in current generation games. These are the kinds of effects AMD wants to bring (back) to PC gaming. The challenge for AMD is that they’re going to need to get developers on board to utilize the technology, something that was a continual problem for Aureal and Creative. We don’t know just how the consoles will compare – we know the XB1 has its own audio DSPs, we know less about the PS4 – but in the PC space this would be an AMD-exclusive feature, which means the majority of enthusiast games (who historically have been NVIDIA equipped) will not be able to access this technology. To jump ahead of that AMD is already forging relationships with the most important firms in the PC gaming audio space: the audio middleware providers. 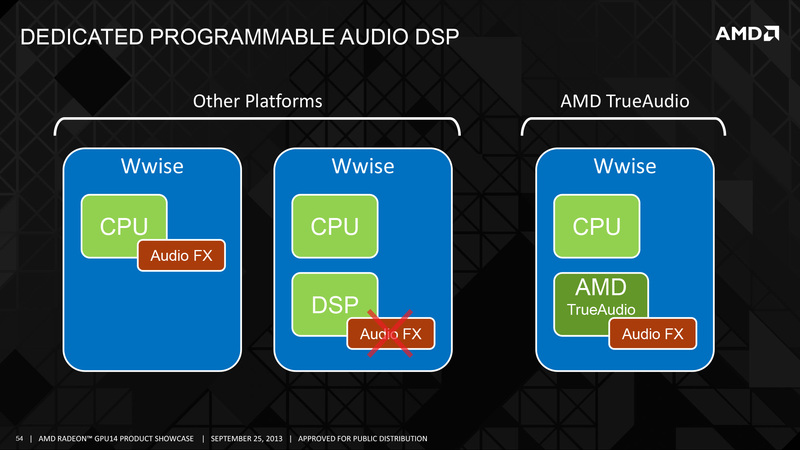 AMD is working very closely with audio firm GenAudio of AstoundSound fame, who in turn has developed audio engines utilizing the TrueAudio DSP. GenAudio will be releasing plugins for the common PC audio middleware to jumpstart the process, Firelight Technologies’ FMOD and AudioKinetics’ Wwise. 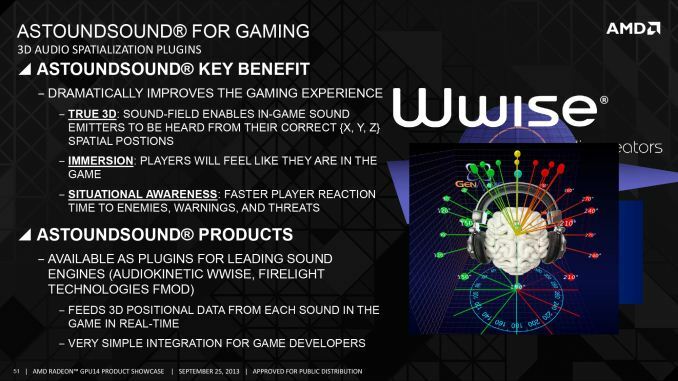 AMD is also working with AudioKinetics directly towards the same goal. AMD is also approaching game developers directly on this matter. Eidos has pledged support in their upcoming Thief game, and newcomer Xaviant pledging support for their in development magical loot game, Lichdom. All of this will of course be available to anyone using the Wwise or FMOD audio engines. It bears mentioning that AMD’s audio DSP is not part of a stand-alone audio card, rather it’s a dedicated processor created so that developers can take advantage of the hardware to process their audio, and then passing that back to the sound card for presentation. This means that the audio DSP can be utilized regardless of the audio output method used – speakers, headphones, TVs via HDMI, etc – but it also means that developers need to actively include support for TrueAudio to use it. This won’t allow 5.1 audio to headphone downmixing for existing software, for example. Developers will at a minimum need to patch in support or design it into future games. Wrapping things up, I had a chance to briefly try Xaviant’s Lichdom audio demo, which is already TrueAudio enabled. As someone who’s already a headphones-only gamer, this ended up being more impressive than any game/demo I’ve tried in the past. Xaviant has positional audio down very well – at least as good as Creative’s CMSS3D tech – and elevation effects were clearly better than anything I’ve heard previously. They’re also making heavy use of reverb, to the point where it’s being overdone for effect, but what’s there works very well. To be clear here, nothing here is really groundbreaking; it’s merely a better implementation of existing ideas on positioning and reverb. But after a several year span of PC audio failing to advance (if not regressing) this is a welcome change to once again see positional audio and advanced audio processing taken seriously. 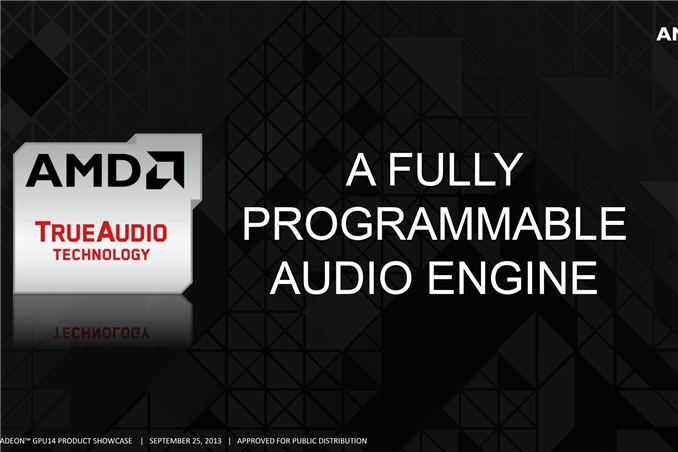 We’ll have more information on TrueAudio later on as AMD releases more details on the technology and what software will be using it. So you must think that MS put a dedicated audio DSP chip in the Xbox One for the sake of it? Windows Vista/7/8 may have stopped hardware audio dead on PC, but it's been alive and kicking in the cinema/HT market. My current high-end AVR uses a wide range of DSPs for maintaining quality while improving positional sounds, including height channels. Sadly, it's pre-Atmos, so I'll have to upgrade when Atmos-enabled AVRs hit the market. Anyway, the state of 3-D audio via the Windows stack is a sad one. Using a $5 ASIC (probably cheaper than that) for 3-D aural calculations is an excellent move. I still use my Audigy 4 Pro w/Alchemy for my older games and the reverb and positional effects are superior to any modern software implementation I've heard so far. The sound quality is noticeably superior as well. Since AMD is using this same technology in the PS4 and XBone, this means that PC gamers (with select AMD GPUs) won't be left with an inferior experience. The logic will carry over whether it's a console-to-PC port or vice versa. At least we'll have the option. It would be nice if AMD equipped ALL their GPUs with it... or sold a separate PCIe 1X or USB adapter so that all PC gamers could enjoy it. GPU agnostic, but they still get paid... Maybe that will be the next wave. "Haha, no, there's nothing a 5 dollar DSP can do that an i7 can't. AMD slapped in a cheap DSP, gave it a marketing term, and they finally have their own exclusive API. Which is all it is since it has to then pass through your soundcard codec. If they actually wanted to advance game audio they would have made an open standard, instead they made a marketing term." Correct me, but isn't that what nVidia do with its PhysX? Choose to make it propietary item instead of open source one like OpenCL. That is until all 3 next-gen console using AMD GPU inside and they scared to death that their technology would go vanished and decide to make PhysX available for next-gen console gaming.